I am, It’s safe to say, a beginner snowboarder. I’ve been two years running and, believe me, approached the slopes with a good deal more respect the second time around having spent the majority of the first year’s holiday on my bum. “How hard can it be? I’m a Ninja, after all!” I smugly thought to myself before I set foot on the slopes, proudly (and only half tongue in cheek) telling everyone “Yes, well, I assume I’m going to be amazing at this”. What is it they say? Pride comes before a fall? Well yes, as it happens it does. And another fall. And another. Between my aches, pains, cold extremeties and the laughter of my friends, I was forced to eat my humble pie with a healthy side-order of Karma ice-cream. 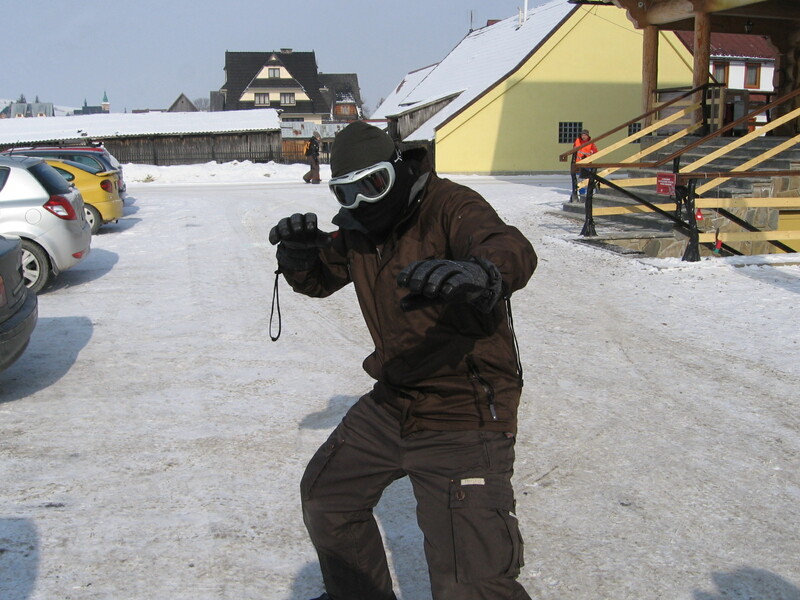 This year I was somewhat quieter before I ventured out on to the slopes. But, to my surprise, things were a lot easier and by luck or design, (and I’m not sure which), I managed to spend more time on a snowboard than my arse. Just. Why? Practice. The more you do, the more you learn. There really is no secret to getting good at something – just keep turning up. And this brings me to my point. There are a lot of people out there peddling ‘self defence’ courses, or one-day seminars, selling the dream that you can learn to defend yourself in five simple steps, or earn a Karate blackbelt in twelve months. Sorry, but you can’t. You may as well send a complete beginner up Everest with a snowboard, waving cheerily and nodding with encouragement as they teeter on the top of a mile high cliff, trying to work out which end of the board’s the front. The physical side of self defence is a skill, a very difficult one, one that can ONLY be mastered over extended periods of practice (and probably getting in to one or two fights just for good measure). The old addage is ‘practice makes perfect’, and it’s true. It’s only through constant repetition of movement or action that a physical skill becomes learned, and ingrained enough to be applied without thinking about so many things at once that you’re more handicapped than if you’d learned nothing at all. Take driving. When you see your dad driving as a kid, the smoothness with which he fiddles with the radio, navigates a roundabout, munches from a packet of crisps and clips you round the ear for talking over the cricket (or is that just my experience?) makes it all look so easy. Then you get behind the wheel, and everything is a challenge – where the gears are, when to change gear, how to change gear, which one the brake is, when to indicate, when to check mirrors, what traffic is doing, where the road signs are, and so on. Everything is a conscious act and, when this is so, you are a danger on the roads and not expected to perform the task of driving with any great skill. And yet in self defence classes, or ‘Black Belt Academies’, so often physical technique is demonstrated, or shown, without acknowledging the years of practice required to embed it as a skill. The only way to make a physical skill an unconscious competence, rather than a conscious incompetence, is to practice, practice, practice some more. You can’t learn it in a day, or a week, or even a month. Ask my sore bum. Or the victim of a mugging who tried to stop it using a move they saw on TV once, or learnt in a days self defence course.